The Fielding community has a new reason to be thankful. 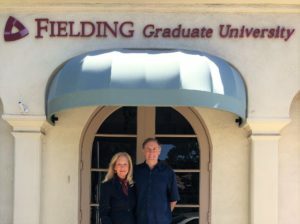 Dean Emeritus Charles McClintock, PhD, and his wife Carol Wilburn have established a new scholarship to support our doctoral students’ dissertation research. The McClintock-Wilburn Family Fund in Leadership will provide financial support to students whose Fielding writing and/or dissertation research demonstrate conceptual clarity, rigorous methodology, and support for socially just leadership. It will be available to our students in 2019, when the next common application cycle opens. A $100,000 deferred gift with additional contributions from the McClintock-Wilburn family will ensure that the scholarship fund grows over time.